1. The deck lights of a vessel connect to a 12 volt electrical system by means of wiring with a maximum current rating of 10 amps. Select the total maximum wattage of deck lights which can be used. 2. Match the following electrical terms with their description. 1. The deck lights of a vessel connect to a 12 volt electrical system by means of wiring with a maximum current rating of 10 amps. Select the maximum wattage of deck lights which can be used. 1. What could happen if a battery is put in with the polarity reversed? 6. What is the first aid treatment for battery electrolyte burns to the eyes? 7. 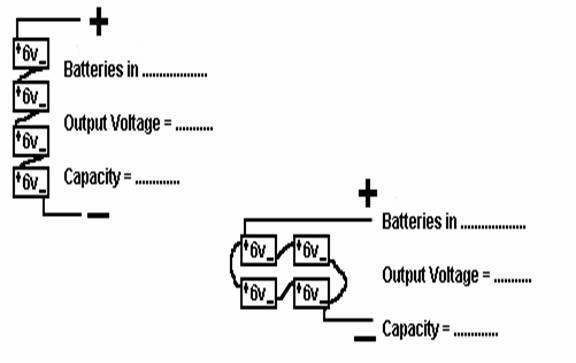 For the battery arrangements below, state whether they are connected in Series, Parallel, or Series/Parallel, and state their output voltage and capacity (compared to a single battery). Wrong polarity may cause severe electrical system damage, and injury! If battery chemicals get into the eyes, immediately flush them gently with clean, fresh, water. Continue gently flushing for at least 20 minutes, and seek urgent medical aid. 1. If a generator stops charging, number in order the items you would check. generator, when the engine is stopped. 7. Open circuits are best found by checking the most likely causes first. Number the order in which you would check the following things looking for an open circuit. 2. From the list below, select two correct statements. d. fatalities caused by severe electric shocks! 4. Select the most likely causes of an electric open circuit. 5. Identify the statements below which indicate the precautions you should take with a vessel’s batteries.